Home / Banking jobs / Vacancy / Sunrise Bank Limited vacancies for various positions. Sunrise Bank Limited vacancies for various positions. 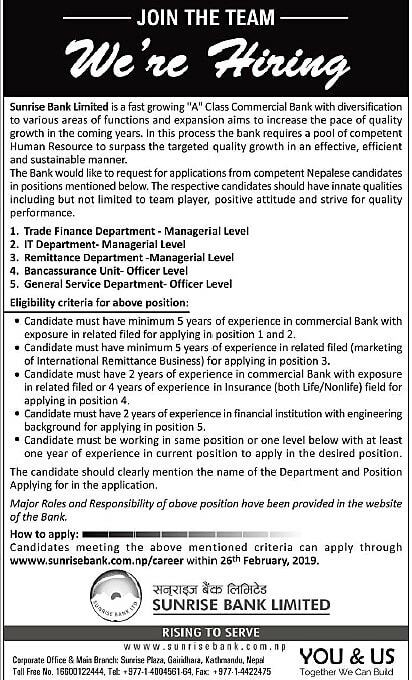 Sunrise Bank Limited request for applications from competent Nepalese candidates in positions mentioned below. The respective candidates should have innate qualities including but not limited to team player, positive attitude and strive for quality performance. Candidate must have a minimum of 5 years of experience in commercial Bank with exposure in related filed for applying in position 1 and 2. Candidate must have a minimum of 5 years of experience In related filed (marketing of International Remittance Business) for applying in position 3. Candidate must have 2 years of experience in commercial Bank with exposure In related filed or 4 years of experience in Insurance (both Ufe/Nonlife) field for applying in position 4. Candidate must have 2 years of experience in a financial institution with an engineering background for applying in position 5. Candidate must be working in the same position or one level below with at least one year of experience In the current position to apply In the desired position. The candidate should clearly mention the name of the Department and Position Applying for in the application. Major Roles and Responsibility of above position have been provided on the website of the Sank. Candidates meeting the above-mentioned criteria can apply through www.sunrisebank.com.np/career within 26th February 2019.